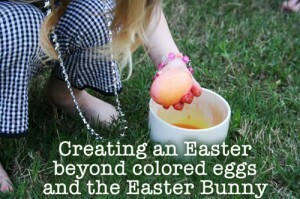 Today I’m blogging over at Tommy Nelson talking about Creating an Easter Beyond the Colored Eggs and Easter Bunny. This year, more than ever we really tried to focus less on the secular hoopla. While I really don’t care to shelter my kids from the secular world, I don’t want to shelter than from Jesus and the true meaning of certain holidays either. Like all things it’s BALANCE people. I am so thankful for the opportunity to blog with a team of fabulous moms who are also dedicated to raising children that know the Lord. Thanks Tommy Nelson!